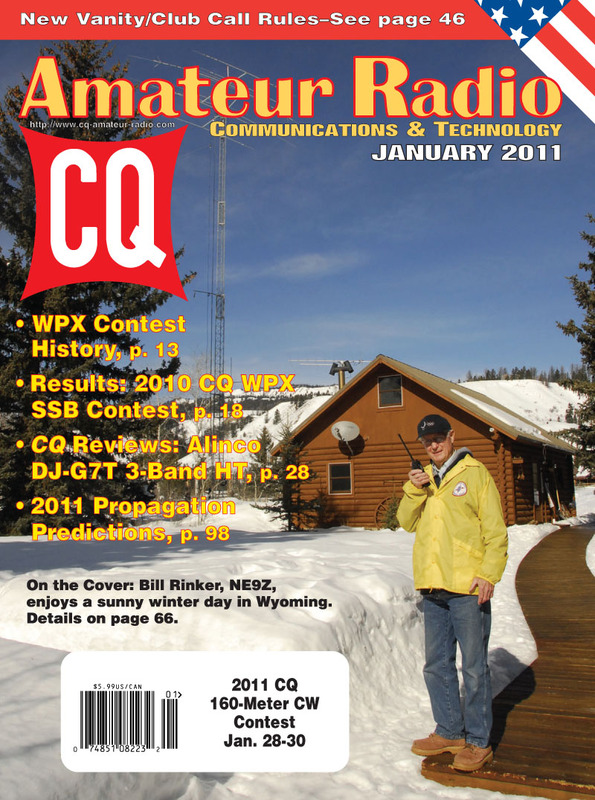 The January 2011 issue of CQ opens with a history of the CQ WPX Contest, by John Pescatore, K3TN, as we look forward to the 55th running in 2011 of what began in 1957 as the CQ SSB Contest. 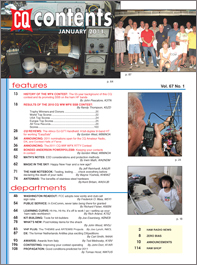 The SSB results of last year's WPX contest are in this issue as well, with top honors going to CN2R (W7EJ op. ), P49Y (AE6Y), ZX5J (PP5JR), YW2LV (YV5YMA), CQ3L (DF7ZS), ST2AR (S53R) and JY5CC in the various single-op categories, as well as multi-op stations 5D5A, HC8GR and EB8AH. The rules for February's CQ WW WPX RTTY Contest are also in this issue, and are here on the web as well (click here to view). The nominating period for 2011 inductees into the CQ Amateur Radio, Contesting and DXing Halls of Fame opens on January 1. The official announcement is in the January issue, and the nominating form for the Amateur Radio Hall of Fame is here on our website. January 1 also marks the beginning of a brand-new CQ DX Marathon. Everybody's slate is wiped clean and we all start from scratch. Click here for the 2011 Marathon rules. Remember to submit your 2010 log by January 31. The January issue also includes a CQ Review of the Alinco DJ-G7T tri-band handheld by Contributing Editor Gordon West, WB6NOA, and a mini-review of bonded Anderson Powerpoles® from PowerWerx, also by WB6NOA. Among our columns this month, "Washington Readout" editor Fred Maia, W5YI, takes us through the details of the FCC's recent rule changes regarding vanity and club call signs; "Math's Notes" editor Irwin Math, WA2NDM, looks at ESD (electrostatic discharge) considerations and protection methods; and Public Service Editor Richard Fisher, KI6SN, reminds us that, "In EmComm, Never Take Being There for Granted." Magic in the Sky" editor Jeff Reinhardt, AA6JR, wonders about the role we hobbyists have played in bringing about the dawn of a new age in communication on a par with the introduction of the telegraph (and whether it's entirely a good thing); we head to the tool shed with Rich Arland, K7SZ's "Learning Curve" column this month, as well as Joe Eisenberg, K0NEB's "Kit-Building" column and "The Ham Notebook" by Wayne Yoshida, KH6WZ. Antennas Editor Kent Britain, WA5VJB, looks at the benefits of stainless steel hardware on antennas and towers; New Products Editor John Wood, WV5J, checks out some "Post-Holiday Items for the Shack;" VHF Editor Joe Lynch, N6CL, examines the THEMIS and ARTEMIS projects and their impact on hams; and DX Editor Carl Smith, N4AA, has more info on the new "entities" formed from the breakup of the Netherlands Antilles, as well as some exciting DXpeditions planned for the new year. Awards Editor Ted Melinosky, K1BV, looks at some awards from Italy; Contesting Editor John Dorr, K1AR, offers tips on improving your contest operating, and Propagation Editor Tomas Hood, NW7US, predicts steadily improving conditions through 2011. That's a brief look at what's coming up in the January issue of CQ magazine, which should be on newsstands and in subscribers' mailboxes by late December. For information on becoming a CQ subscriber, click here. Happy New Year from all of us at CQ!